Melinda Loomis: Macadamia nut milk? Yes please. Macadamia nut milk? Yes please. 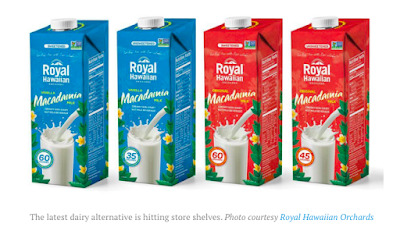 This is great news: Hawaiian macadamia nut milk has arrived. Image snicked from the linked article. Though the company is not yet releasing exactly which regions and stores might carry the new product, they claim it will be available in groceries and natural food store shelves on the Mainland and locally in Hawaii starting this June. The entire line of Royal Hawaiian Orchards products are certified Non-GMO by the Non-GMO project. We are committed to providing the best. If it's going to be available on the mainland, I'm thinking we have to have it somewhere here in L.A. I'm really looking forward to trying this stuff.